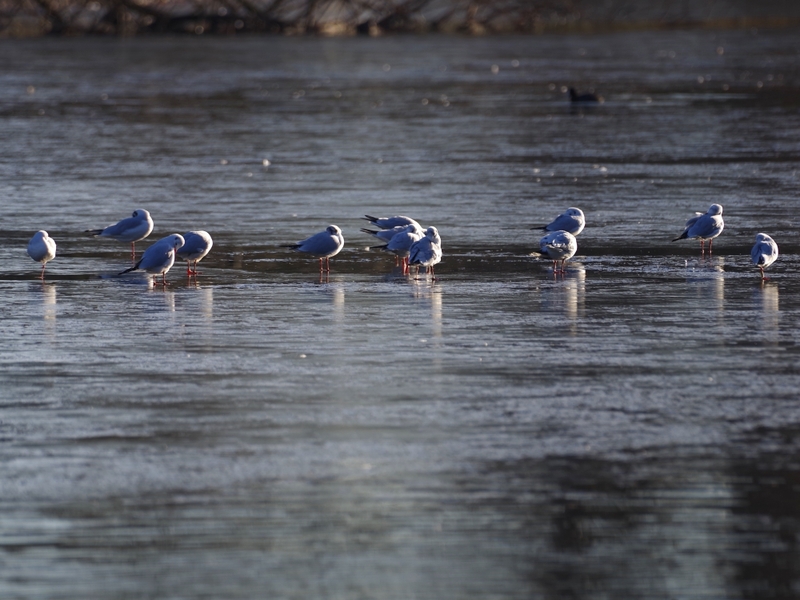 After a frosty night there was ice on both the Long Water and the Serpentine. 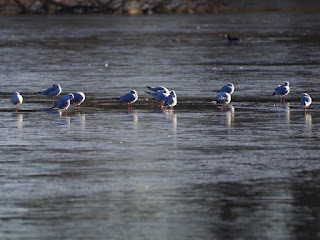 As usual, Black-Headed Gulls found it an agreeable place to stand. It would be pleasant to be so indifferent to cold. 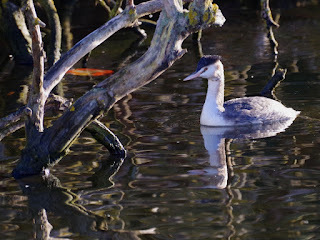 A Great Crested Grebe had got boxed in by the ice at the north end of the Long Water. It was fishing under the dead willow. It will be all right, because the ice will melt in a day or two. But this is something that Great Crested Grebes normally manage to avoid. 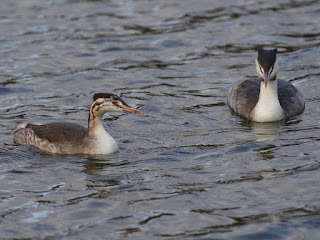 The teenage grebe and its parent were out on the open water in the middle of the Serpentine. 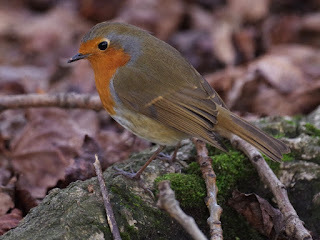 I think this young bird is the only one of the three chicks to survive becoming independent. It's a severe test of fishing ability, and casualties are high. 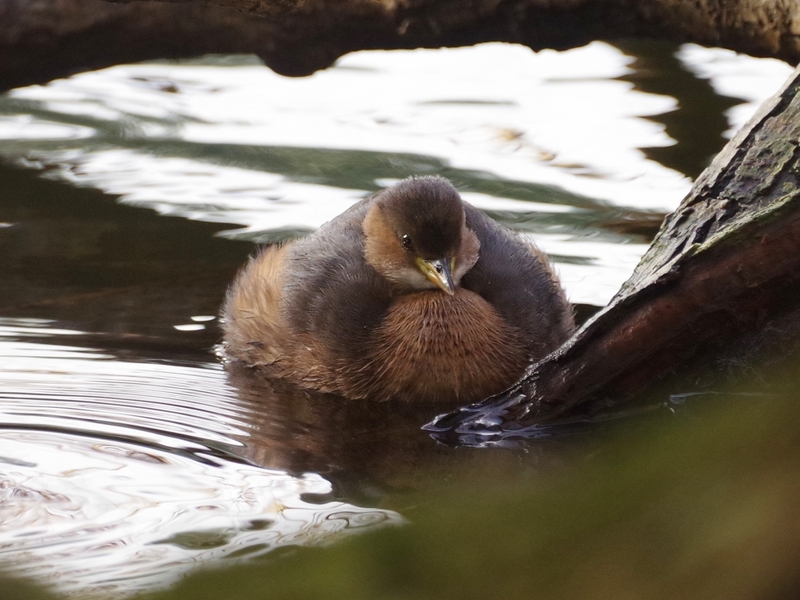 There was a Little Grebe under the willow tree near the bridge. 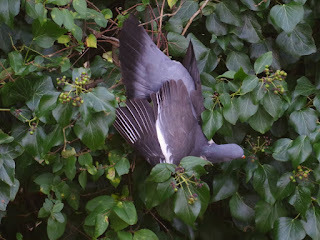 I've only seen one here, and I think that the other -- which was not its mate -- has flown back to Regent's Park or St James's Park, both of which support a permanent population. A Cormorant circled endlessly over the wire baskets next to the bridge, but they have fished the place out. There are now almost no fish of a size to interest them, and probably the remaining few birds will leave the lake soon, returning next summer. Unlike Cormorants, grebes can manage quite well when stocks of medium-sized fish fall low. Smaller and more agile, they can hunt smaller fish in the tangles of submerged roots and branches, and also find invertebrates there. A young Herring Gull picked up a stick to play with but found it was too large, and discarded it in favour of a bit of yellow plastic. 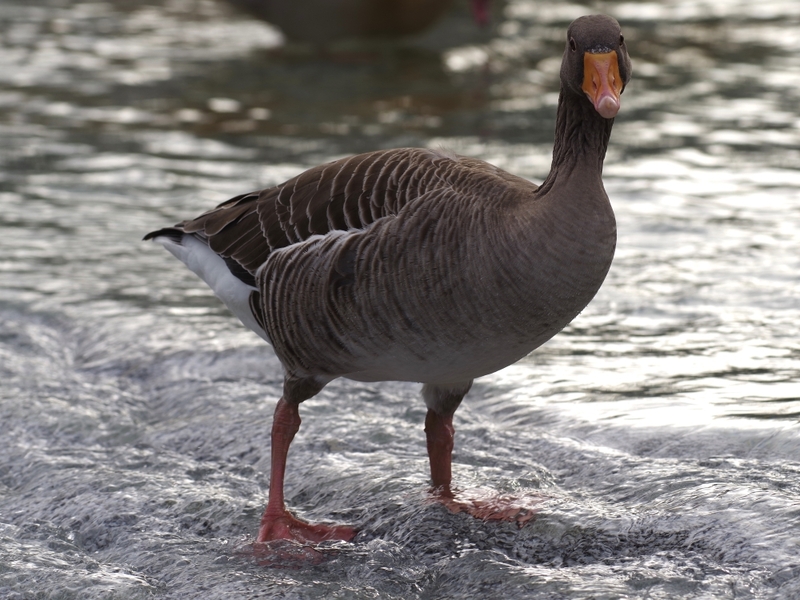 Greylag and Egyptian Geese bathed together in their favourite place at the top of the rapids in the Diana fountain. The blond Egyptian with the injured foot can be seen being chased in the background, running well but still a bit hesitant when walking. 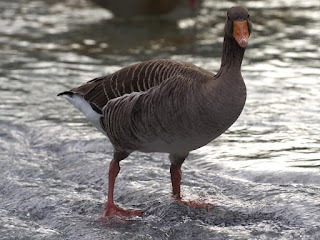 One of the Greylags stood at the top of the rapids. They enjoy the sensation of water flowing fast over their feet. But if it were to go any lower down the slope it would be swept away by the current and fall ignominiously into the pool underneath -- I've seen this happen. 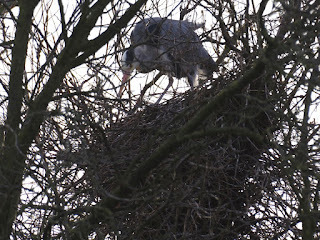 The other Grey Heron nest on the island has been reoccupied. This is not the nest that hatched successfully last year. 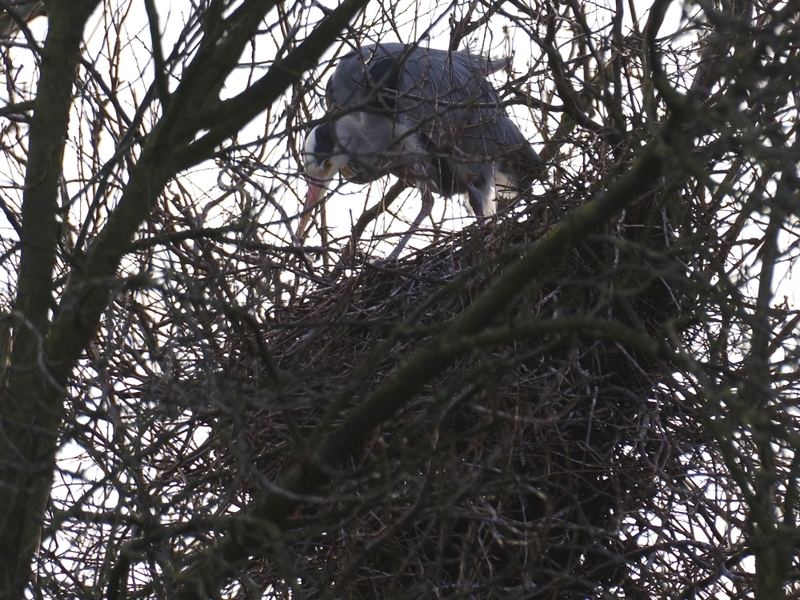 That fell down, sadly killing two young herons though one survived. A pair of Carrion Crows enjoyed a bath together in the Serpentine. 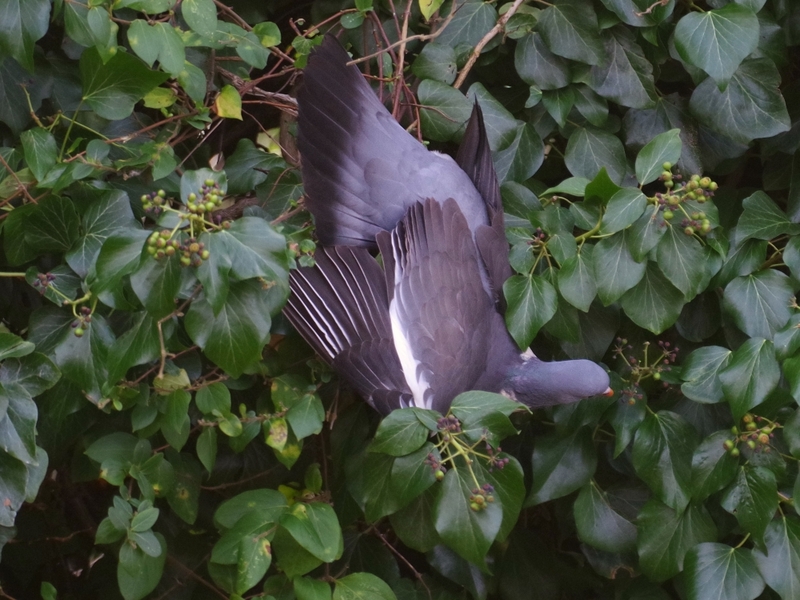 A Wood Pigeon ate ivy berries at the back of the Lido. A second after I took this picture it lost its footing and tumbled out, flapping to a crash lading on the grass beneath. 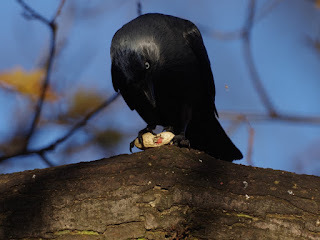 A Jackdaw skilfully opened a peanut. The Robin who owns the bush in the Rose Garden where the feeders hang waited with great impatience for them to be refilled, flitting about from twig to twig. I have finally discovered the names of the two splendid people who maintain these feeders and replace them when they are stolen, helping many small birds to survive the winter. They are Rani, to whom I talked today, and Belle. Good luck to both of them. 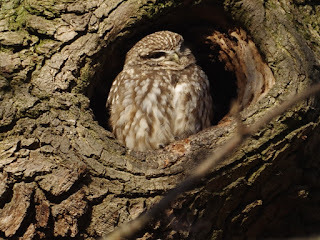 The Little Owl near the Albert Memorial stared out of her hole. 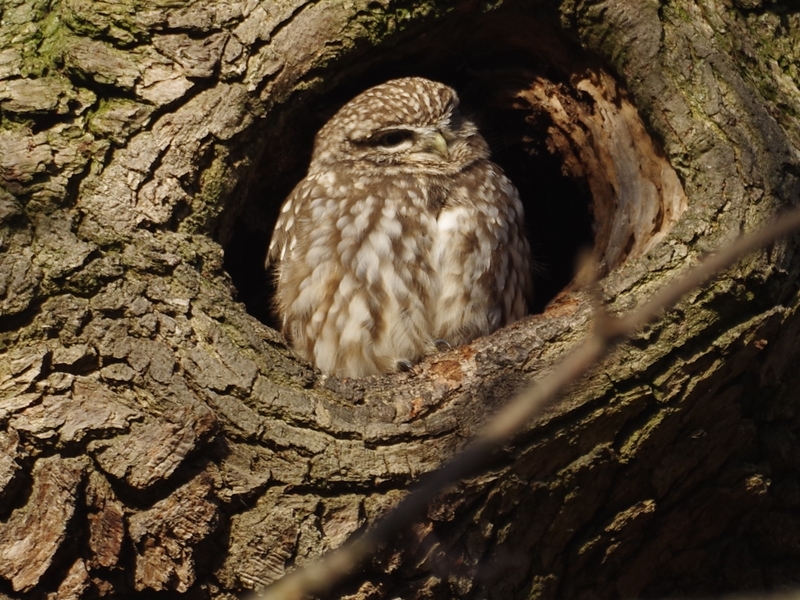 She was looking at some Starlings on a branch, but decided they were no threat and settled down to doze in the morning sunlight. 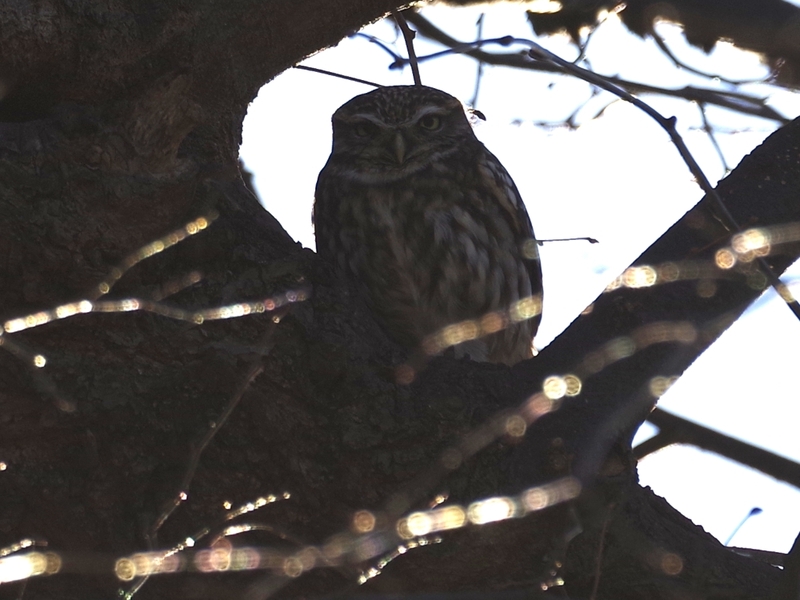 The owl in the lime tree near the Henry Moore sculpture doesn't like having the sun in her eyes, and almost always faces away from it. The crows clearly don't mind the temperature either- bathing in this weather, and they're not even water birds. I do know that hens can overheat, so are not impervious to temperatures. Most birds seem amazingly tough- how do they manage? I guess they need more fatty food. Some birds have clever heat-exchanging arrangements in their circulation so that their feet can run at a lower temperature than the rest of them. What a charming poem, thank you. Three sparrows sit in a little crush. Chirpy John in the middle rank. But overhead, oh, how it snows! But John is warmest in the middle. If they're not gone, they sit there still. God, that's such a lovely rendition! Many thanks for the translation. When I was a small child I wanted to be covered in feathers (I also fantasized about having wings when I was walking to and from school). I was quite repulsed by my human hair! feathers are the secret to bird's warmth, I think. Thank you for your kind words. I too could do with some feathers in this dismal weather. But they do take an awful lot of looking after to keep them in good condition.